Cirsium pumilum.© Gary P. Fleming.Digital Atlas of the Virginia Flora..2014. Virginia Botanical Associates, Blacksburg. www.vaplantatlas.org. (Accessed 5/2014). 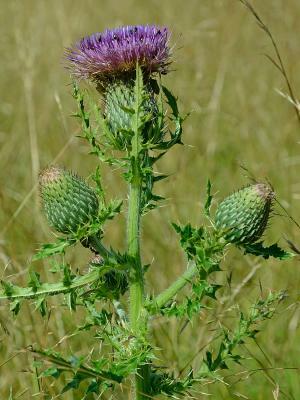 Cirsium pumilum is a biennial herb, 30-80 cm tall, from a deep taproot, stems stout. Leaves alternate, first year rosette leaves numerous, short-stalked, blades 12-25 cm long, 2-7 cm wide, widest above middle, pinnately divided, margins prickly, green on both sides, stem leaves lance-shaped, shallowly lobed and toothed, very prickly, reduced upwards. Flowers purple, fragrant, tubular, heads 3.5-5 cm long, outer bracts spine-tipped, inner bracts papery, tips appearing shredded, wavy, longer than outer bracts; blooms June-Sept.
Fruit dry, 1-seeded achene 0.4 cm long. Habitat: Dry fields, open woods.